The Gist of it: A glamorous movie star constantly finds herself in unsavory circumstances as a result of her nutty press agent's schemes. 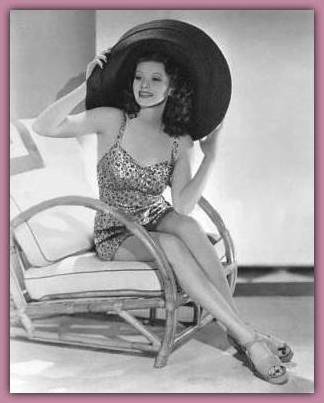 Movie star Annabel Allison (Lucille Ball) is experiencing a bit of a slump and in need of some good publicity to revive her career. The head of publicity at Wonder Pictures is a wacky character named Lanny Morgan (Jack Oakie). He dreams up a "brilliant" publicity stunt for Annabel. He can just imagine the headlines; "Movie Star Annabel Allison goes to jail to study life behind bars" (for a part in a picture). He plans to get her out after a few days but the stunt backfires and she ends up in there "long enough to write the biography of Monte Cristo", and no headlines upon her release, for her troubles. Infuriated, Annabel goes to the head of the studio, Howard Webb (Bradley Page) and sees to it Lanny's fired. It's only a temporary setback for him. He tricks Annabel into thinking his mother is in desperate need of surgery. She feels terrible and gets him his job back. Within a few minutes Lanny has another "brainstorm". Upon hearing about Annabel's new picture, The Maid and the Man, he gets her a job as a maid in an "average American household" to gain experience for the movie. He thinks it will be great publicity, and actually she does, too. That is, until she arrives at the Fletcher home; which turns out not to be so average a household. In this house lives an eccentric older gentleman they call The Major (Thurston Hall), a husband and wife and their love-starved adolescent son, Robert (Lee Van Atta), who falls in love with Annabel at first sight. Luckily, the Fletcher's don't recognize "Mary's" true identity, so all goes well at first, until Mrs. Fletcher (Elisabeth Risdon) tries to get Annabel to wax the floors! It's not too bad though, with Lanny's help she makes it through the first day successfully- but the real action is about to begin. The Fletcher's have two houseguests who unbeknownst to them are crooks on the run from the cops. They hold Annabel and the Fletcher's hostage in the house. Meanwhile, back at Wonder Pictures, The Maid and the Man has been called off, so they want to cancel the publicity stunt too. Lanny calls Annabel at the Fletcher's to tell her but she tells him she can't leave the house. He knows something's wrong and he finds out what it is when her old mug shot as "June Brayce", from when he had her put in prison, turns up on the front page of the newspaper! Annabel had been seen with one of the criminals and reporters found her mug shot and mistook "Miss Brayce" for a gangster's moll. Well, Lanny's really gotten her into trouble this time. Dangerous criminals are holding Annabel captive in the Fletcher home. He has to find a way to get her out. Lanny, Howard Webb and three studio writers cook up an elaborate production to get Annabel out of the house. They bring along a director and a hundred male extras dressed as policemen to charge up to the house and scare the criminals into submission. It works fairly well until the actors find themselves being fired at with real bullets! Lanny sneaks inside the house to try and help. Finally, the real cops arrive on the scene. The crooks try to make a run for it, holding Annabel and Lanny as human shields as they try to get away. As Lanny is on the verge of collapse, Annabel twists her captor's arm and hurls him to the floor. As he struggles to get up the cops step in and arrest them. The ordeal is over and headlines all over the world declare Annabel a heroine. She's back on top; it's the greatest publicity she's ever received. In spite of everything they've been through, Lanny will never learn his lesson. The title of Annabel's next picture is changed to The Diamond Smuggler, so he decides a new publicity campaign is in order. Before she can say "Lanny is louse", he double-crosses her again and she finds herself being hauled off to prison once more because Lanny had planted jewels on her. An unwitting and enraged Annabel balls Lanny out as she is arrested for suspected diamond smuggling! The Affairs of Annabel opened on September 9, 1938 to an enthusiastic public who enjoyed watching Annabel get into trouble at the hands of her crazy publicity agent. This box-office success prompted RKO to produce a sequel called Annabel Takes a Tour. Lucille and her co-star, Jack Oakie became friends. Three years later, when Lucille and Desi were just married and looking to buy a house, it was partially through the influence of Jack Oakie that their search was lead to the newly developing Chatsworth area, a serene locale far-removed from the heart of Hollywood. Oakie lived there and the picturesque 5-acre ranch they purchased was not far from his home. Lucille faired well in The Affairs of Annabel. In addition to the film's financial success she received good reviews, too. Playing glamour girl Annabel Allison, she's basically the comic foil to Jack Oakie but she still gets a chance to display her own comedic abilities while trying to get back at her press agent and fending off the advances of both an amorous police officer and a starry-eyed adolescent.